Please allow approximately 1m extra around the edge. + 1.5m in blower at rear. Power Requirement – 1 x 10amp. 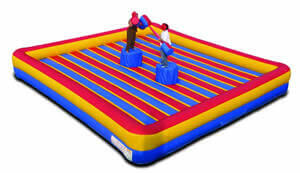 Gladiator is an awesome inflatable bed that has two podiums in the middle. Two challengers with boxing helmets, mount the podiums and then try to knock their opponent off their perch. Its not as easy as it looks and is hilarious fun for competitors and spectators alike. Suitable for young and old. Great fun and suitable for 6 years and above. Up to 3 hours hire – $350 plus GST.